← Good Housekeeping discusses Pranayama! Update #2 (January 2019): In late 2018, the Balance Tai Chi folks decided to discontinue their open classes and, instead, to operate as a club. They deactivated their Facebook page, as well. Update (March 2018): If you are interested in learning tai chi with Balance Tai Chi, please contact that club’s organizers through its Facebook page. 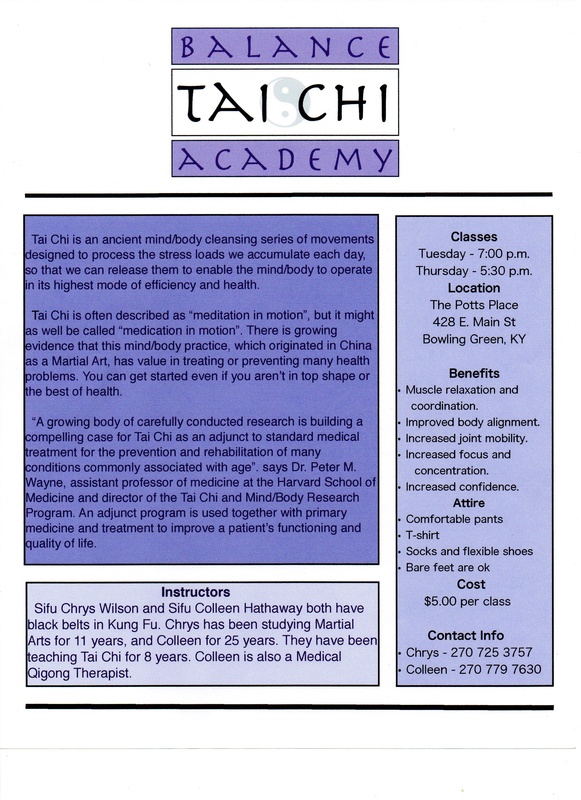 See the flyer below for information about the tai chi classes at The Pots Place. Note: since we originally posted this flyer in 2013, the time of the Tuesday tai chi class has changed. Both Tuesday and Thursday classes now meet at 5:30 p.m.